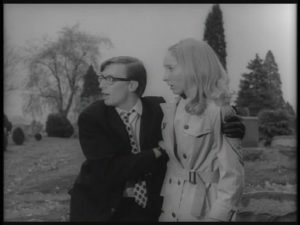 The Talking Dead: Exclusive Interviews with Barbara and Johnny from Game-Changing Zombie Classic "Night of the Living Dead"
Russ Streiner and Judith O’Dea as Johnny and Barbara in “Night of the Living Dead” (1968). Image courtesy of IGN.com. 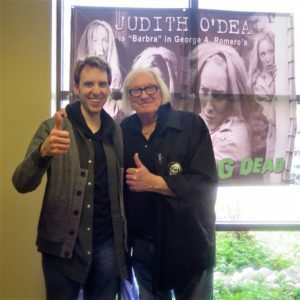 Two of the cast members from “Night of the Living Dead” attended the “Mad Monster Party 2017” event. 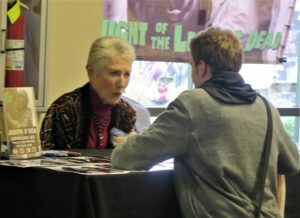 Judith O’Dea, who played the role of Barbara and will reprise that role in the upcoming “Night of the Living Dead: Genesis,” draws her fans into relaxed conversation with her winsome smile and polished speech. Russ Streiner, who both produced “Night of the Living Dead” and played the role of Barbara’s brother, Johnny, recalls his experiences with enthusiasm and a sense of humor. He binds fans to an honor system—every time they say or think his line, “They’re coming to get you, Barbara,” they have to drop a quarter in their pillowcase and bring the fee to him at the next convention. Their personalities and experiences made for an entertaining interview with Legendarium Media. Judith O’dea and Andy Poole. Image taken by Pamela Poole. Legendarium Media: Well first things first, I hear that you have a story you like to tell concerning considering Johnny and a certain tombstone. Judith O’Dea: This is a special story that I have? Legendarium: According to a video I saw of you. Judith O’Dea: The one thing that I can recall that I love to tell is when Johnny was killed by Bill Hinzman, our zombie, the sound his head made when it hit that tombstone, even to this day, grabs me. Do you know what that sound actually was? Legendarium: [Russ Streiner] dropping a watermelon. 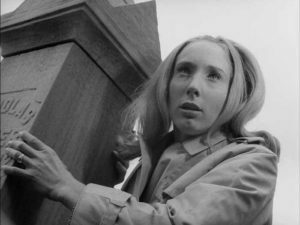 Judith O’Dea as Barbara in the opening cemetery scene in “Night of the Living Dead” (1968). Image courtesy of http://www.nightofthelivingdead.net. Judith O’Dea: YES! I love that! Legendarium: What sticks with you [about] that to this day? Judith O’Dea: Overall, the thought that almost 50 years now, coming up in 2018, this film has changed my life. We never would have guessed that it would grow in popularity as it has, but to have this as a wonderful legacy is truly an honor. Legendarium: So, before “Night of the Living Dead,” zombies tended to be more attached to like voodoo cults and mind control. Do you know what inspired the departure to being more like flesh-eating creatures? Judith O’Dea: You’d have to talk to George Romero about that, because I don’t believe I’ve ever really given it that much thought. I was just so thrilled to be in a feature film at my age that I didn’t think about why zombies would want to eat humans. I’m glad it worked out that way. 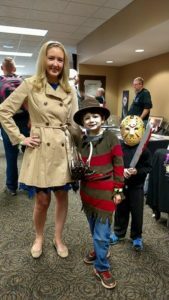 It’s as if Judith O’Dea stepped out of a time machine at Mad Monster Party 2017. Barbara brought Freddy and Jason along, too. Image taken by Andy Poole. Judith O’Dea: Ah! People have come to say “Hello” and have said, “How do you feel being the momma of all these zombies? I mean, you’ve given birth to this apocalypse.” That’s a pretty exciting thing to think about, that we’ve played an important part in this zombie craze. I’m thrilled to have started it all, or helped. Legendarium: How did you get into the film business? What interested you in becoming an actress? Judith O’Dea: Ah! I always, always wanted to be a performer, singer, actress, ever since I was a tiny kid. I can remember that even before I entered school, I would sit on the stoop of my grandma’s, my great grandmother’s home and I’d sing and pretend in my mind all kinds of wonderful things. So, it was just something that I needed and wanted to do ever since I was a little kid. Andy Poole and Russ Streiner. Image taken by Pamela Poole. Legendarium: First things first, what got you started in the film industry and what interested you most about it? Russ Streiner: I started off when I came out of high school. I never wanted to do anything other than being an actor, and so I went to drama school for acting. I was doing live stage presentations and during that part of my life is when I met George Romero. He was working on a film at that time, it was one of his first productions called “Expostulations,” and asked me if I would be in the film as an actor. I became fascinated with the process of film production, so George and I just started to hang out and eventually we became business partners and after we became business partners is when “Night of the Living Dead” came into being. Russ Streiner as Johnny in the opening cemetery scene in “Night of the Living Dead” (1968). Image courtesy of Wikipedia. —when we shot the film—was that almost 50 years later that people [would] still [be] interested in the movie and still interested in the work that we did so many years ago, which is very flattering. 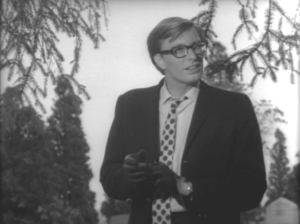 Russ Streiner: Well, I think that the story once “Night of the Living Dead” got the dead walking again, there’s been all kinds of spin-offs and that kind of thing and so, you know, “Night of the Living Dead” did its job and created a genre. Legendarium: Do you have any advice for any aspiring filmmakers, whether on the acting or production level? Russ Streiner: Endurance, stamina, persistence, stick with it. It is not the easiest job in the world to make a living at, but in my experience, people who are serious about it, they stick with it, the opportunities begin to open up in a very plentiful way. Especially nowadays because there’s more and more companies seeking content. As long as that quest for content goes on, they need creative types to create it.